Carbon monoxide detectors are at least as important as fire or smoke detectors and protect our lives. But once you have bought a suitable device, the question arises as to where to hang it most sensibly. m Internet you will find many half-truths. Reason enough to shed light on the matter once and for all. Mount the carbon monoxide detector vertically on a wall, keeping a distance of 10 cm between the upper side of the housing and the ceiling. Do not mount the carbon monoxide detector directly above the fireplace. If possible, hang it next to the door or passageway leading to the rest of the living area. Carbon monoxide detector in the middle, top or bottom of the wall? Here there are different conditions to consider. On the Internet one often finds the blanket statement that carbon monoxide is lighter than air and would therefore settle up in the room. Accordingly, the carbon monoxide detector should be mounted on the ceiling. That is not completely correct however. The density, thus the weight of carbon monoxide is only completely slightly lighter than air. And these weight data mentioned always refer to a reference air pressure, which might prevail with the fewest of us in the living room. However, we must not ignore the fact that in most cases carbon monoxide is produced by burning processes, which usually release heat and the carbon monoxide will therefore rise to the ceiling simply because of its temperature. So yes, the carbon monoxide detector should rather be hung up in the upper area, but where exactly? For the sensors of the carbon monoxide detectors to work, it is important that the carbon monoxide flows well through the housings. This is not so much the case under the ceiling as if the device were mounted vertically on a wall. In order to allow a little more flow from bottom to top through the case, we should keep a distance of 10 cm between the top of the case and the ceiling. Hanging the carbon monoxide detector by the fireplace? The carbon monoxide detector should be hung in the room where carbon monoxide can be produced. In my case, this is the living room, because that is where our fireplace is. It is also important to note that the acoustic alarm signal extends from the detector's place of installation to the bedroom and that in the event of an alarm you will still be awake. This is the case in our apartment with the detector I used, but the part is also brutally loud. Now the question arose whether I should hang the carbon monoxide detector directly above or next to the fireplace. Answer: No, because possibly small quantities of carbon monoxide escape when refilling wood when the stove is in operation and thus cause false alarms. It makes more sense to install it on a wall opposite the fireplace or near the door leading to the living room. If the carbon monoxide produced leaves the room in which it was produced and wants to move towards the hallway, dining room or bedroom, the alarm is triggered before the gas arrives in other rooms. 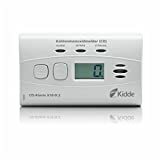 I myself use the "Kidde CO-Alarm X10-D.2". The manufacturer belongs to the United Technologies Group, which in turn also includes well-known brands such as the "Gloria" fire-fighting professionals. This is one of the reasons why I chose this device. Another reason is the discreet appearance of the detector and the overall good ratings on the Internet. After the installation I found out another plus point. The device is awfully loud. Although the device is hanging in the living room and the alarm signal first has to pass through the dining room and hallway until it arrives in the bedroom, I'll easily wake up if the device is triggered at night. If your fireplace is burning, use the extractor hood in the kitchen with extreme caution. When the cooker hood is used, a vacuum is created in the house which causes air to be drawn in from outside when the windows are closed. It can now happen that, due to the negative pressure, fresh air tries to draw in through your chimney, badly only if it is not air but carbon monoxide. Therefore, if you turn on the extractor hood while your fireplace is burning, you should always open a window in the kitchen.